We offer a wide variety of shade options for your boating needs. Let us know how much coverage you need and we can come up with a custom shading option to meet your needs. 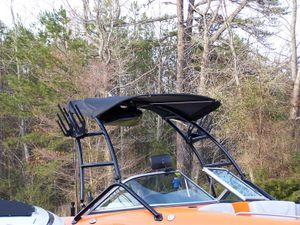 Adding a front bimini top is a popular request from pontoon boat owners. We are able to add a bimini top to match your factory rear bimini or hard top. A matching joint piece between the 2 frames, bimini boot, and boat cover alteration (to accomodate the new framing) are all included. Frames for pontoon boats are made from 1 1/4 inch square aluminum tubing and the frame is mounted securely to your existing railing. Adjustable locking legs offer added stability and ensure a great looking, tight top. The top is constructed from your choice of Subrella or Recacril canvas in your choice of color. The canvas is then secured to the framing with heavy duty marine zippers for easy removal if needed. Shade options are available for any boat! A ski boat will benefit having additional shade for the driver. Heavy duty round stainless steel framing is used for ski boats ensuring they will withstand high speeds on the lake. We can accomdate existing towers and will work with you to develop the right shade solution for you and your boat. Shading options are very customized. Please contact us for a quote for your shading needs.